Situated inland, Cat Hole cave is the easiest of the Gower Peninsula’s famous bone caves to access and explore. 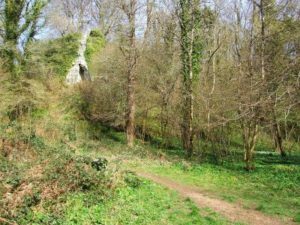 Reached from Parkmill Heritage Centre by following the footpath through Parc-le-Breos, the cave can be found only a short distance north from the neolithic burial monument of Giant ‘s Grave. Set some 15 metres above the valley floor in a limestone rock face, the entrance to the cave can be reached by a rough track that rises steeply through the woodland to the east of the main footpath.